A huge family resort built by the former owners of Heavenly and Steamboat Springs in the US (purchased by the American Skiing Company in 1997 and latterly by Vail Resorts and Intrawest) and Tignes in France. This is a full service ski-in resort which can accommodate nearly 3000 guests and has excellent international standard facilities, there are no towns nearby. 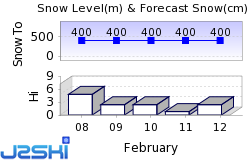 The next notable snow forecast for Rusutsu is 2cm1in, expected on 26 April, with around 2cm1in forecast over the next 7 days. The Japanese Ski Resort of Rusutsu is one of the larger Ski Resorts in Japan and has direct access to 40km25 miles of downhill skiing, with 37 marked pistes, served by a total of 17 ski lifts. A huge family resort built by the former owners of Heavenly and Steamboat Springs in the US (purchased by the American Skiing Company in 1997) and Tignes in France. This is a full service ski-in resort which can accommodate nearly 3000 guests and has excellent international standard facilities, there are no towns nearby. The best area are the runs either side of Izola No. 1 Quad lift. We don't currently have confirmed season dates for Rusutsu. NOTE:- Lift and Piste openings are always subject to Snow Conditions in Rusutsu. The 17 ski lifts of Rusutsu are able to uplift 30,000 skiers and snowboarders every hour. Rusutsu is in Hokkaidō, Japan. The nearest airport to Rusutsu is New Chitose which is 142 minutes drive away. Other popular Ski Areas near Rusutsu. Want to ask about skiing and snowboarding in Rusutsu? Or contact Rusutsu Tourist Office. Note :- The information on J2Ski concerning Rusutsu, where not clearly factual, is opinion only and is neither definitive or exhaustive.